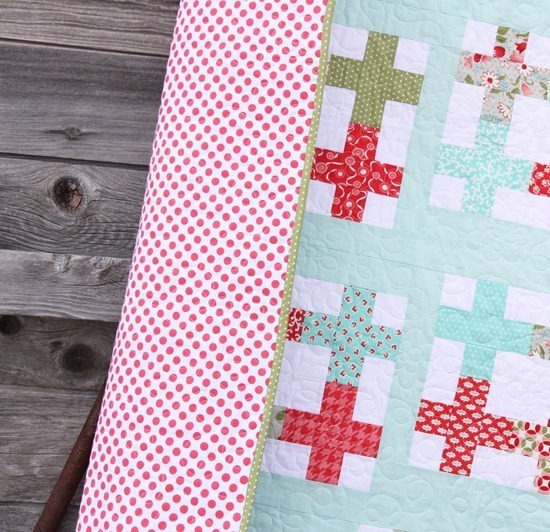 One last pattern quilt to share…jelly roll friendly Tea Party. This one was made with a Vintage Modern jelly roll. The background fabric is Kona Solid in Ice Frappe, it’s a nice minty aqua without being too AQUAAAA!!!! If you know what I mean. The quilting was done by again by April Rosenthal…she did an amazing job free handing swirls and flowers all over. The backing is Ta Da Dot by Michael Miller in lipstick. If you’ve ordered PDF patterns and haven’t received them please email me…you should have had them instantly. Thanks! Another beautiful quilt! I am loving that background Ice Frappe color! It's beautiful! I love the shade of blue you chose, it compliments the modern vintage perfectly! 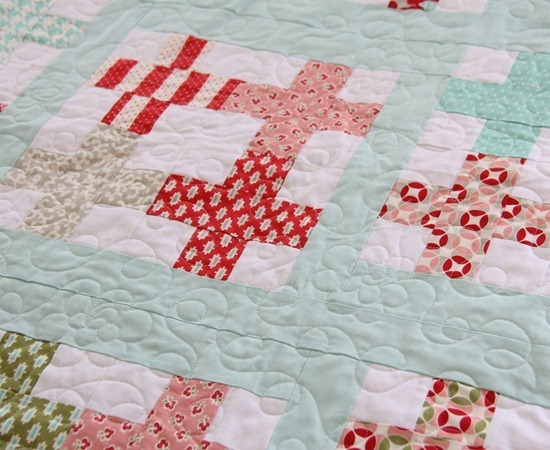 Love your Tea Party Allison and very nice quilting!! So nice and lovely quilt! J. A lovely summer table topper as well! I love the backing on this one! Crazy about the red and white polka-dot fabric! Very pretty quilt, as usual. It is a beutiful pattern, I love it. 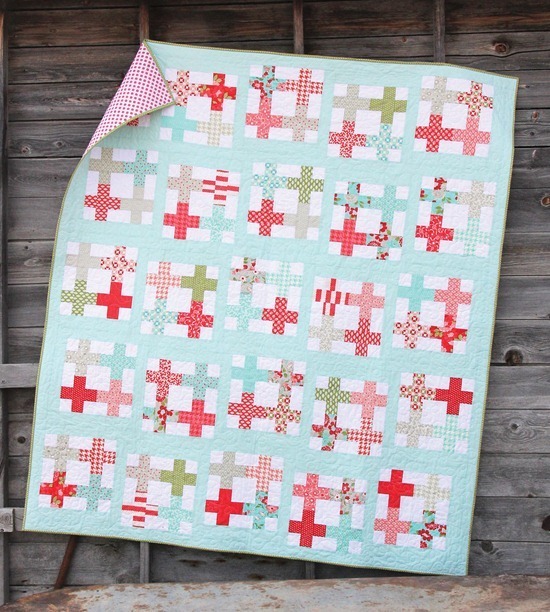 Your quilt designs are really great–clean, crisp and always great fabric choices. That is a really pretty quilt, I love the colors you used. You really have alot of wonderful patterns! What a beatiful quilt, I really love it. I love the pretty colors, they match so nicely together! The quilting looks awesome! GORGEOUS! 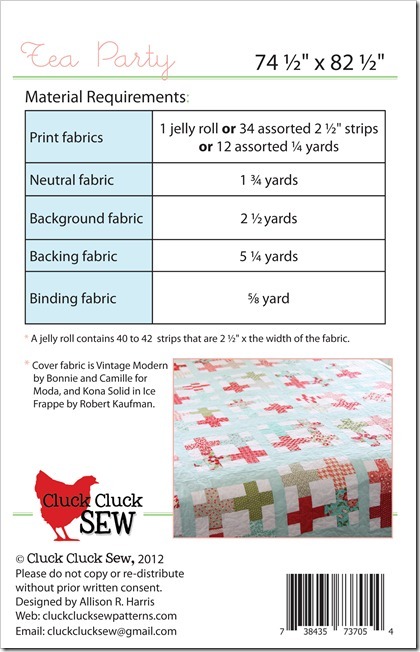 I still need to get some of that vintage modern and now I guess another quilt pattern! thanks for listing the name of the light aqua! I love it and it's perfect! I love your quilts. I'm very new to quilting and just as I was getting excited about finishing my first quilt my machine started making a really loud noise. I oiled it in all of the places my manual suggests but the noise won't go away. (I made a 1 minute video of it so people could hear what noise it is making). http://www.youtube.com/watch?v=HDlY9R7ABXk Any advice as to what could be wrong so that I can get back on my way and finish my quilt?